It’s been a busy week down here in Charleston, SC, working on KINDA HOME. Good news is - as of today, we’ve got a full-length draft of the work complete! This was one of our goals, and it feels great to know we’ve met it! Of course, the show is far from done. There will inevitably be things to tweak, change, rewrite as we continue to move forward. But for right now, we’re just excited to be able to share a reading of the first full-length draft tomorrow at PURE Theatre! Posted on April 19, 2019 by Min Kahng and filed under Composition, Creative, Musical Theater, Performing Arts, Writing and tagged playwright vlog composer vlog composerlife playwrightlife musical theatre vlog Pure Theatre charleston workshop new musical Kinda Home Brad Erickson. I’m in Nebraska City for two weeks for a residency at the Kimmel Harding Nelson Center for the Arts. In my latest vlog, I give a tour of my apartment here as well as some tips about self-care and convenience while at an artists residency. Posted on March 21, 2019 by Min Kahng and filed under Career, Performing Arts and tagged playwright vlog composer vlog playwrightlife composerlife musical theatre vlog Kimmel Harding Nelson Center for the Arts Nebraska City artists residency self care self. For a couple years now, I’ve been trying to think how I could be using YouTube, but any idea I came up with just seemed so time-intensive. Tutorials? Interviews? Analysis of plays and musicals? It all took research or extra prep that I just did not have time for. Well, I’ve finally landed on vlogging. A simple look-at-the-camera vlog. I’ve had younger and/or newer playwrights tell me that just hearing about my journey and work as a playwright/composer has helped them somehow. So, I’m starting a vlog and maybe someone will stumble upon it and find it meaningful for them. Who knows. I’ll not make much of a hullabaloo because I’m also learning how to vlog as I… well, I explain all this in the video, so just watch if you like. Posted on March 7, 2019 by Min Kahng and filed under Career, Musical Theater, Performing Arts, Writing, Creative and tagged playwright vlog composer vlog musical theatre vlog Kinda Home story explorers playwrightlife composerlife. L to R: King Midas (Matt Standley), Queen Midas (Aly Casas), and Princess Lydia (Elisha Beston) on their annual stargazing picnic. Photo by Alessandra Mello. GOLD: The Midas Musical opens tomorrow at Bay Area Children’s Theatre, and while it is my 9th world premiere, it actually has a past that begins all the way back in 2011. Nina Meehan, Executive Artistic Director of BACT, approached me with a commission to adapt the Midas myth into a musical for young audiences - particularly targeting those in upper elementary and above. I loved the idea of expanding this classic myth for contemporary theatregoers, and with a proposed opening of 2012, I set to work on it right away - writing sketches of about four songs and crafting a script that focused on the relationship between Midas and his daughter. But then, the direction changed. Nina thought a stronger new work would be one that addressed Greek mythology broadly, rather than the one myth. Of course, she was right. I was just starting out as a writer, and BACT was just starting its programming for older kids. A show about several Greek myths would be more readily appealing to kids (Percy Jackson was just kicking into high gear), and had more potential for educational value for teachers. And so, Midas went into my figurative drawer, and Tales of Olympus was born. After its world premiere, Tales went on to a Bay Area school tour, a touring production in Chicago, a young actors adaptation, and will once again be produced at the Children’s Museum Indianapolis this summer. So yeah, good call on the Greek myths thing! But I always knew I wanted to re-visit Midas. In 2016, I opened the file and started to work on it again. It was strange. In those five years, I had changed as a writer. The jokes and lyrics felt like a younger me, and I had to think hard about what of the original sketches could be retained if I were to actually finish it. I completed the piece enough to do an informal table reading at Playwrights Foundation, to which Nina Meehan was invited. After the reading, she expressed interest in seeing how it developed further. And so, I continued to work on it, keeping her up-to-date on latest script drafts. Then, she included in BACT’s 2018-2019 season. 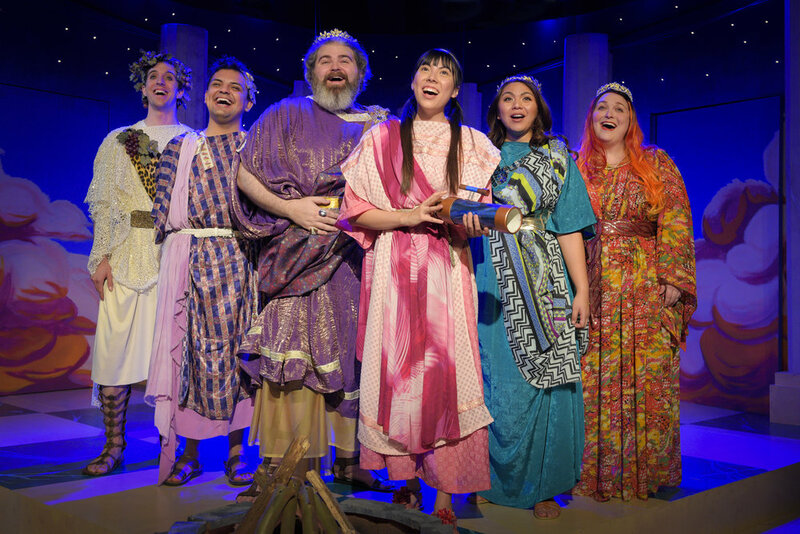 L to R: Nysus (Andrew Mondello), Hilarion (Christian Arteaga), King Midas (Matt Standley), Princess Lydia (Elisha Beston), Queen Midas (Aly Casas), Hestia (Sheila Townsend). Photo by Alessanda Mello. It’s very apparent to me that had I finished GOLD in 2012, it would have been a completely different show. In the eight years from conception to production, I have transformed into a much more competent, self-aware, and experienced writer. I believe I was able to bring an emotional depth to GOLD that might not have been there if I completed it on its original due date. Of course, there are still remnants of the original draft - three of those original song sketches have stayed in the show in some form, and I don’t know that I’ll ever lose my childish humor that others like to call “Min jokes.” So, GOLD feels like a sort of commemorative piece for me. A marker to show how much I’ve progressed in career and creativity. I’m proud it’s getting to see the light of day, and I hope you’ll be able to see it before it closes! Posted on February 22, 2019 by Min Kahng and filed under Adaptation, Career, Composition, Creative, Musical Theater, Performing Arts, Story, Writing and tagged Gold The Midas Musical Bay Area Children's Theatre Tales of Olympus. This weekend, I learned that I am a 2019 Jonathan Larson Grant Finalist. I was among the 25 to make it to the final round of consideration out of an applicant pool of almost 300. So, even though I didn’t actually win the award, learning that I am a Finalist is its own boost of confidence. Because it means that I was seen. It’s nice to just feel seen! I’ve been applying on and off for this particular grant for about 10 years now. I think in years prior, I applied with a sort of “please notice me” mentality - meek, somewhat apologetic, and really hoping the grant could be something that makes me. But last year, while applying for 2019, I felt different. There was a shift in me. I was no longer applying from a place of lowness, desperately hoping for a launch into the heavens. I was more sure of myself. I knew what I had to offer, and that it was worthwhile for the panelists to consider. And I believe that level of knowing myself helped me write a strong enough application to become a Finalist. I was seen, because I actually believed I was worthy to be seen. Now, I don’t want to set up a “prosperity gospel” of “If you simply believe it, it will happen!” Over these 10 years, I’ve also worked hard, written lots, made connections, gained skills and momentum. But I am saying that while you’re doing the hard work, if you aren’t fully believing that you’re worthy of it all (and that’s to be read differently than “entitled to it all”), it will bleed out into how you go about seemingly mundane things like grant applications. Where did my self-assurance come from? Honestly - time. It has taken time to develop and discover both my writing and my identity. To go from apologetically inserting myself into the musical theatre field to proudly claiming my own space within it. Of course, self-doubt persists. It has not been eradicated. But, I’ve learned some life skills to help me sort through those negative feelings and hold myself with kindness. I’m already thinking of how I might update my application for next year. Even if I’m never awarded this particular grant though, I know I’ll be able to carve my own path - the path I need - to be happy. Posted on February 6, 2019 by Min Kahng and filed under Career, Creative, Musical Theater, Thought, Writing and tagged Jonathan Larson Grant American Theatre Wing self-doubt confidence grantwriting grant application.